Looking for a great, fun & healthy snack? Pursito Brand Honeystix are proudly made in the USA from pure 100% natural honey utilizing raw, unfiltered, organic, kosher methods and products at Dunbar Honey Farm. Dunbar Honey Farm works to use & promote the most natural approach to beekeeping, honey & health. Pursito honey straws create an outrageous experience for your taste-buds that few edible products can equal. All Pursito Honey are packaged with the same label and ingredients are determined by the type of honey stick. Pursito Plain Floral Honey Sticks fall under the "Plain" category and the ingredients are as follows: US Grade A Honey. Grab the mini snack your friends and family will love! Set aside the messy honey jar, the clean up, and the inaccurate measurements. At 1 tsp per honey stick, these easily measured and perfectly proportioned sticks are a great healthy on the go snack with no mess and no packets. BURSTING WITH NATURAL FLAVOR these HoneyStix are a healthy and fun favorite for ages 2 and above. Also entertain with class by adding these as a compliment for your guests' tea or coffee. ALL PURE HONEY STICKS are as nature intended unflavored, no additives, or coloring added. These honey sticks are locally produced in the Pacific States of the USA. As an all-natural product, small sugar crystals may form - to return to original state: heat slowly in a warm water bath until they disappear. 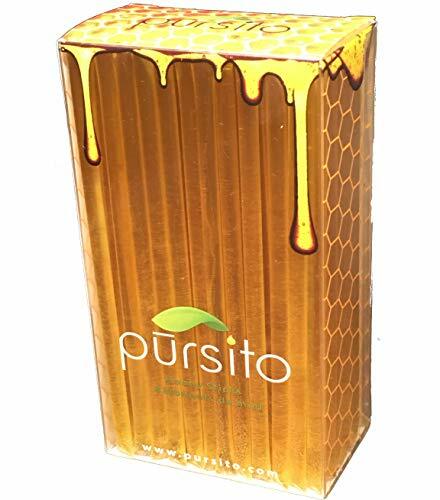 Pursito Brand Honeystix are 100% PURE DOMESTIC US GRADE A HONEY, 100% Natural, No Color, Made in Oregon, USA Perfect for snacking, sweetening drinks or foods and excellent for travel. There is no expiration or shelf life for honey. However, we recommend using within 1 or 2 years for best quality & flavor. YOU WILL RECEIVE 100 Pursito Brand Pure Easy Open Honeystix in your purchase. SHIPPED in a heavy duty corrugated box to help ensure freshness, quality & a safe delivery. With thousands of happy customers, Pursito is a brand you will love and can trust! We stand by our product with a 30 day money back guarantee.